Welcome to Pinnacle at Fullerton Apartments in Fullerton, CA. It’s the perfect combination of city excitement and the tranquility of a small-town neighborhood. You’re within walking distance of everything, with plenty of space to relax and unwind. 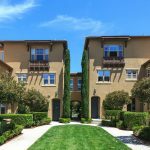 These pet-friendly Fullerton apartments for rent in Orange County are built to suit your style. Choose from a wide variety of floor plans, from cozy studios to multilevel townhomes. Enjoy options like two-tone paint, a double-sided fireplace, nine-foot ceilings, and ample storage. Pinnacle at Fullerton Apartments offers many wonderful amenities in this downtown community. Relax in the pool and spa at the end of a busy day. Entertain guests in the clubhouse, complete with a kitchen, TV, and beautiful, modern décor. Or, get things done in the business center. There’s even a comfortable conference room complete with a projector screen.